A catch-22 is a paradoxical situation from which an individual cannot escape because of contradictory rules. Catch-22s often result from rules, regulations, or procedures that an individual is subject to but has no control over. You know a person could go crazy trying to keep themselves free from toxins. These days it seems to be an all consuming, and virtually impossible task. Sometimes I wish I knew a lot less. Sometimes maybe ignorance is bliss. And cheaper. And a LOT less stressful. Meghan has been seen by a “biomedical specialist,” (insert voodoo, witchcraft, flawed medicine – whatever makes you happy) since she was about 2. So, I read. I researched. I altered her diet. I added some key supplements. I started to see results – but not enough. This doctor, whose office we just left a few hours ago – over 8 years since our initial meeting- got to know Meghan. He told us he could help. And he has. He has been my sounding board through lots of ups and downs. I have never, and will never take any one person’s word on what I should do for my daughter – doctor or not – but he is one of the opinions I value highly. He had the gumption to prescribe digestive enzymes after YEARS of horrendous stool and horrific stomach aches. “We don’t need to biopsy the pancreas. Sometimes we just need to use our heads to see what works.” Not too often these days will you find any medical professional with that confidence or drive to do what is right. Through the years we have visited his office at least 3 times a year for lengthy consultations. He has suggested countless things to help aid Meghan’s immune system, her pain, her tendency towards chronic fatigue. I have listened to many, and ignored a few. Conversations have evolved over the years as we have each stayed up to date on current research. The initial diagnosis of Cowden’s Syndrome seemed to bother him a great deal. He was bothered by the ramifications of the syndrome, but also by the fact that there was no way this was “all of it.” Meghan “doesn’t fit in a box,” he would always tell me. Never let them try to put her in one. And, perhaps truer words have not been spoken. As we have navigated the world of Cowden’s Syndrome, I have been acutely aware that there is still “something else.” But, since we are yet to put our finger on it – we continue doing the best we can. Cowden’s Syndrome involves screening tests. Regularly. For cancer, and vascular malformations that can form anywhere at any time. X-Rays and CT scans are discouraged because of radiation exposure and a fear that cells can be “tripped.” So MRI is the test of choice. MRI with contrast that is. Gadolinium to be exact. I’ll get back to why that is important in a bit. We have spent the last 2 years especially, (but really the last 5 or so for Meghan considering the AVM in her knee was discovered LONG before the Cowden’s Syndrome diagnosis) being scanned. In July Meghan had an MRI ordeal that involved 4,000 images, 3 hours, 2 tubes, and 3 doses of contrast dye. We have spent the last few years dealing with a rapidly growing child whose pains seemed to be increasing exponentially. We have gone from treating with Advil to treating with 200 mg a day of Celebrex. We have spent the last few years trying to help her stay calm- only to watch her anxiety mount. In September she was diagnosed with Alopecia Areata– an autoimmune condition that causes hair loss. Fortunately for us it seems to be contained to a small area, but it is an unnerving diagnosis still the same. We understand the role of autoimmune disease and stress, and toxins. We understand the role that stress can play on a genetic mutation of the PTEN (tumor suppressor) gene. We understand that there is external and internal stress. We do what we can to control stress on the body. We make sure she has “down time.” We try to help her get rest. We got her involved in swimming, a sport she loves. We make sure she eats a largely organic diet free of the foods she can not tolerate like gluten, dairy and soy. We eliminated almost without exception preservatives and dyes. We bought new pots and threw out the plastic plates we used to use sometimes. We started giving her ISAGENIX, the organic superfood that is as pure as I seem to be able to find. And even at that – there is an awareness that we can NOT control it all. There is an awareness that by whatever mechanism that is broken, our girl does NOT detoxify properly. 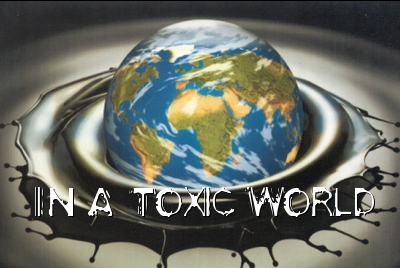 We are aware of toxins in the air, in our soil, and even in our filtered water. 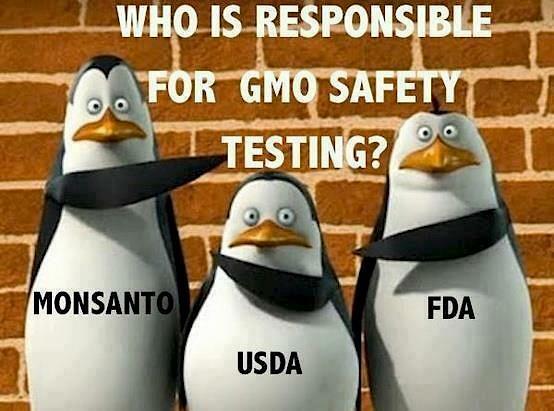 We are aware that her body is confused by this world we live in, by the GMOs that are even hidden in her organic diet. 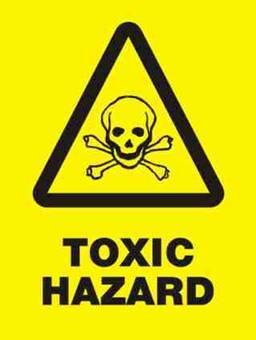 Chelation therapy is a proven treatment for lead poisoning and poisoning from other heavy metals. The term has been spoken over and over again by the “bio medical doctor.” Chelation is the concept I found every single excuse to overlook and ignore. The idea shook me to my core. She went for her first treatment last month. After the treatment there is an 8 hour urine test to measure the toxic metals excreted. 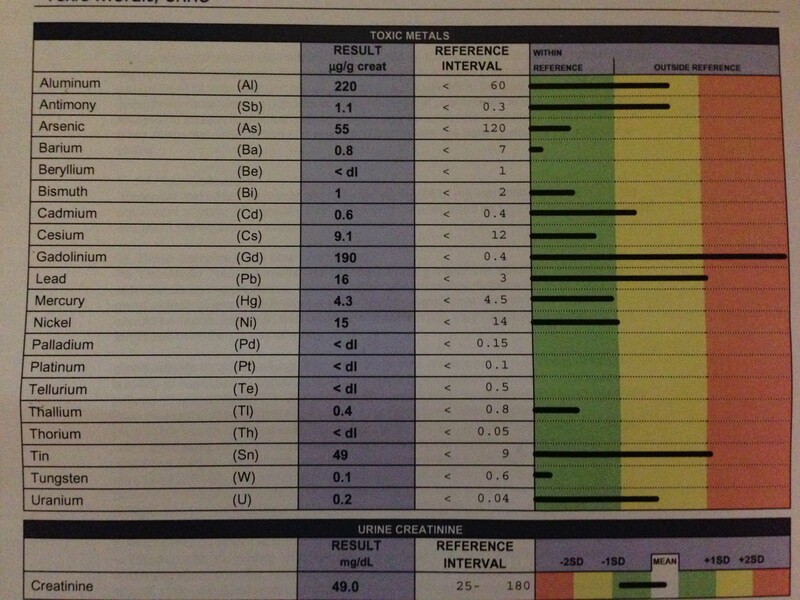 She went for her second treatment today and I got to look at the printout of last month’s urine analysis. So, even as I held her, and she wailed in pain, and two veins rolled before they got a good one, my resolve was strong. The reference range for that MRI contrast dye Gadolinium I mentioned earlier is <0.4. Her output was 190. No I am not forgetting a decimal. Gadolinium. Necessary for the cancer and vascular screenings set to be part of her life forever. Except apparently her body can’t seem to excrete it. Next I STILL HATE CHEMISTRY! Wait. Let me see if I understand this….her body can’t process the “contrast” that we get with the MRI’s, is that what you’re saying? Can this doctor help her body learn/fix/figure out how to do that? I am speechless. Praying for her. And you.